The Ocean View district has always been intrinsically tied to transportation. 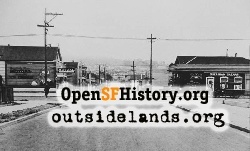 Started as a community built with homestead associations around a railway station, the Ocean View grew from a valley of dairy and vegetable farms to a vital urban neighborhood. Alemany Boulevard, the Interstate 280 freeway, and BART (Bay Area Rapid Transit) took the place of the old steam locomotives, as the Ocean View continues to host the paths from San Francisco to the Peninsula. Looking south on Capitol Avenue across Farallones Street, circa 1910 - Courtesy of a private collector. 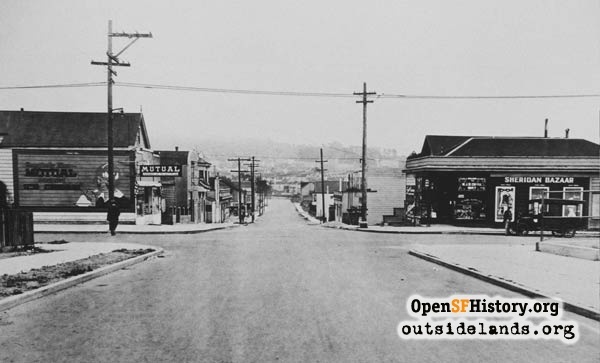 Originally an Italian-Irish-German neighborhood, the Ocean View was one of the few places in post-World War II San Francisco where African-American families could buy property. During redevelopment in the Western Addition/Fillmore in the 1960s and 70s, more African-American families moved to this western neighborhood. In the early 2000s, relatively lower real estate prices brought in a new influx of Asians, Latinos, and Caucasians, making Ocean View one of the most culturally diverse neighborhoods in San Francisco. A lack of vital services in the area is an ongoing concern. A few landmark businesses, such as Reno's Barber Shop (opened 1960) and Furlough's Tonsorial Parlor (1955) have closed or stuggled on. The new Ocean View library was a major triumph for the often neglected neighborhood, and community groups have had success fighting the drug dealing and crime that marked the area in the early 1990s. Ocean View Recreation Center and Park plays host to soccer games, children's programs, theatrical productions and all sorts of community events. History of Ocean View, by Marsha Fontes, written in 1993.